1.1. On the ICO landing page scroll to the Orderbook widget and click "Contribute" button. If you already have an Orderbook account, click "Log in". You can see the bonuses* progress bar in the left part of the screen. The contribute button will lead you to the registration form. Log in button may be used by registered users. 1.2. Fill in all the fields with your personal information and tick all necessary boxes on the right. Click "Create an account". The information you indicate should match the info from your KYC document and investor verification. 1.3. In order to authorize your email, Orderbook will send you a message with a confirmation code. Enter it in the field to proceed. 1.4. 1.4. After you have successfully registered, you will receive an email with an encrypted container. Please decrypt it following the instructions from email. This contains your private key backup. Please save it after decrypting. DO NOT send or expose your private key to anyone! 1.5. In order to enable password recovery and 2FA, you must verify your phone number. You may now use your login and password to access your account. 1.6. Select the currency you would like to contribute with. More information concerning our identity verification process can be found here. 2.1. Enter your Last Name, First Name and Date of Birth. All the information you indicate should exactly match your verification documents. Your country should match your verification document exactly. 2.3. Upload your document to submit the registration form. 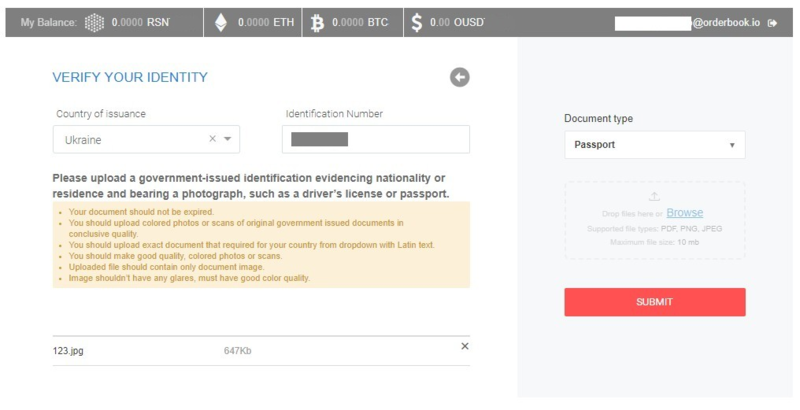 Select the Country that issued your document, enter your ID number, select your document type. Your verification request will be analyzed automatically. Please follow the instructions to upload your document. 2.4. Wait for the verification process to complete. Usually, it takes up to 1 hour. If your status read “declined”, please contact support for more information. 2.5. Click "Continue" to proceed to payment. 2.6. Select currency to contribute. 2.7. Enter the amount of tokens to buy or amount of currency to contribute with. 3.1. If you are located in one of the listed countries and you are willing to buy security tokens, you must also confirm your Accredited Investor status. There are four verification methods available for US citizens. Requirements are attached in a PDF file on the widget page. Please attach required documents before submitting the form. 3.2. One verification method is available for Canadian citizens. 3.3. Please wait for documents to be identified for eligibility. 3.4. Add all necessary documents. If we decline your documents, please contact [email protected]. 3.5. If you were successfully accredited, reload the page.Select the currency you want to contribute with. 3.6. Enter amount of tokens to buy or contribute with and proceed to purchase. 4.1. Select the currency to contribute with. 4.2. If you want to pay with US dollars, enter amount of tokens to buy or contribute. 4.3. Send a wire transfer from your bank account using payment details indicated below. Note that wire transfers may take up to 5 days. 4.4. If you want to pay with Bitcoins, enter amount of tokens to buy or contribute. 4.5. Send the appropriate amount of bitcoins to your BTC deposit address. The deposit address is indicated below. You can also use the QR code to autofill the deposit address. Wait for the transaction to complete. Please stay at this page until the transaction is complete! 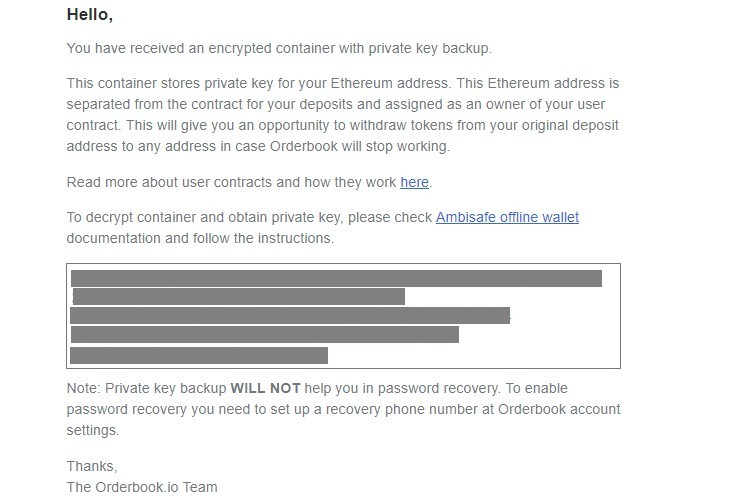 Orderbook needs your private key to sign your transactions. Your private key is only decrypted in the browser when you are logged in to your Orderbook account. If you close this page, you will need to return to it and log in. Wait for the transaction to finish. Transaction processing can take from a couple of minutes up to an hour or more. The time required, depends on the network load). After your transaction has successfully confirmed, your balance should display your ETH/BTC. Orderbook will now convert your deposited currency into tokens. If your tokens have not converted after more than 6 hours, please contact support.